Prison Officials have finally confirmed that some 16 persons have died in the Camp Street Prison riot with 5 being affected with varying degrees of burns. Director of Prisons Carl Graham at an emergency press conference on Thursday afternoon was pellucid that everything was done to save the lives of those that died. 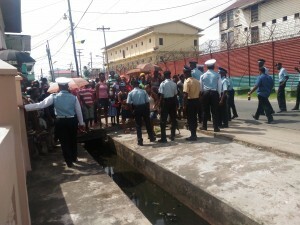 It was explained that 15 persons died on the spot at the prison with one dying at the Georgetown Public Hospital. Officials were reluctant to divulge the identity of those injured indicating that families have not yet been informed. Ranks from the joint services also sustained injuries. “All that was possible was done to prevent that fire…the officers would have worked in the face of heat, missiles being thrown by the inmates and very adverse conditions to ensure that prisoners were brought out of the building,” said Graham. Kevin Pilgrim, Superintendent of Prisons stated that officers would have braved missiles from the prisoners in an effort to get them out of the block. He revealed that the saga continued on Thursday due to some prompting from other inmates. “During that exercise it was going quite smoothly however, as a result of some amount of prompting by some of the general population – the remaining of the inmates in the prison refused to come out…the chanting started and the doors were barricaded and the fires lit again,” said Pilgrim. The prison block that was involved in the fire was Capital A which housed prisoners that were remanded and those who would have been committed to stand trial for various offences. Officials also confirmed that the prison was built to house 600 prisoners but now house some 984 “in house” prisoners. The Capital A block housed 68 prisoners. Meanwhile, Public Security Minister Khemraj Ramjattan labeled he situation a “crisis” noting that already steps have been taken for some external investigation to be done. So far, officials have concluded that the riot was spurred by a search and seizure of contraband. “The search revealed 19 phones and a quantum of narcotics being in the hands of prisoners in that Capital A…There was some vexation about that and they started protesting and that then led to taking off from their beds and putting next to the grill door their mattresses and setting them on fire,” said Ramjattan.